Back in 2009, when Apple announced accessory support for iPhone OS, they proposed an at-home medical device capable of sending data to doctors. The iHealth dock is that device, and it could totally transform your relationship with your blood pressure. There are plenty of reasons people take their blood pressure at home, and a blood pressure gizmo can be had at any local drugstore for as little as $30. But the iHealth dock—a non-descript white charging station for iPhones and iPads—and accompanying Blood Pressure Monitor app update the self-administered blood pressure test for the 21st century. It doesn't just simplify the act of getting a blood pressure reading and streamline the process of sending that data to a doctor; it makes the whole idea of doing potentially scary health stuff at home a lot less intimidating. It's a small but significant step in what could be a big paradigm shift in medicine, leveraging the power of the connected devices to make staying healthy more convenient and more efficient. The iHealth dock, which charges the iPad when it's plugged in and runs on a battery when it isn't, comes with a customary blood pressure arm cuff which can be detached and stored when not in use. The app itself—colorful, touchable, and friendly—does the rest of the work, keeping track of your readings, showing 'em to you in easy-to-read graphs, and beaming them to your doctor via email. Strapping the cuff on in the Gizmodo office felt kind of weird—there's some strangeness to doing things you've only ever done in a doctor's office not in a doctor's office—but it's a pleasant weirdness. The app doesn't look any more foreboding than any of the other apps you're used to using on your iPhone or iPad—in fact, it looks more inviting than most—and generally makes taking your blood pressure understandable and unintimidating. After the familiar squeeze of the arm, the app informed me that my blood pressure was a bit high—thanks, CES!—and logged it along with the date and time for future retrieval. It was easy, it worked, and it didn't complicate matters by making deal with anything resembling a scary hospital procedure. 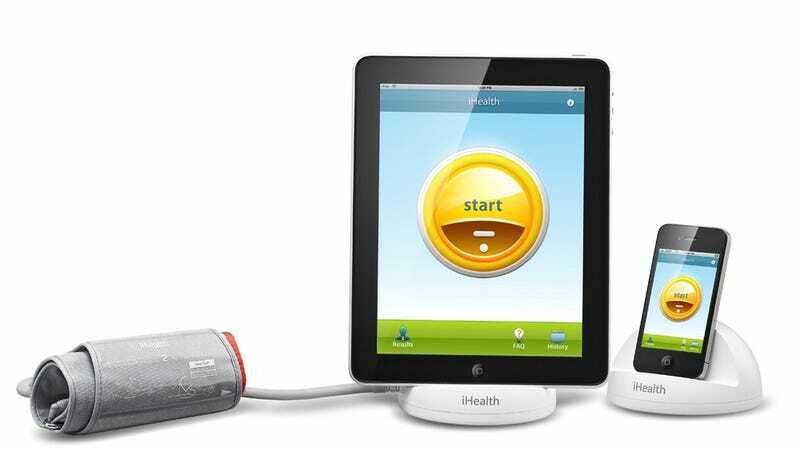 iHeath plans to expand their line of devices with a glucose monitor and connected scale later this year. The company hopes that the products won't just appeal to people who need to take their own medical data but also to people who just want to. And while the doctor's office will always has its place, giving people the tools to check up on themselves on their own time is an incredibly powerful idea.